From U.S. Poet Laureate Juan Felipe Herrera, one of the most prominent Chicano poets writing today, here are poems like sweet music. Awarded the Pura Belpré Honor for this book, Herrera writes in both Spanish and English about the joy and laughter and sometimes the confusion of growing up in an upside-down, jumbled-up world—between two cultures, two homes. With a crazy maraca beat, Herrera creates poetry as rich and vibrant as mole de olé and pineapple tamales...an aroma of papaya...a clear soup with strong garlic, so you will grow, not disappear. Herrera's words are hot and peppery, and good for you. They show us what it means to laugh out loud until it feels like flying. 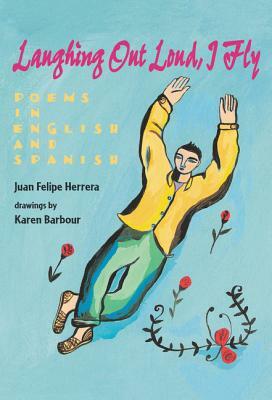 Juan Felipe Herrera's vibrant poems dance across these pages in a dazzling explosion of two languages, English and Spanish. Skillfully crafted, beautiful, joyful, fun, the poems are paired with whimsical black-and-white drawings by Karen Barbour. The resulting collage fills the soul and celebrates a life lived between two cultures. Laughing out loud, I fly, toward the good things, to catch Mamá Lucha on the sidewalk, afterschool, waiting for the green-striped bus, on the side of the neighborhood store, next to almonds, José's tiny wooden mule, the wise boy from San Diego, teeth split apart, like mine in the coppery afternoon . . .
Juan Felipe Herrera is the U.S. Poet Laureate and was inspired by the fire-speakers of the early Chicano Movement and by heavy exposure to various poetry, jazz, and blues performance streams. His published works include 187 Reasons Mexicanos Can't Cross the Border: Undocuments 1971–2007; Border-Crosser with a Lamborghini Dream; Mayan Drifter: Chicano Poet in the Lowlands of the Americas; Thunderweavers/Tejedoras de Rayos; Laughing Out Loud, I Fly, a Pura Belpré Honor Book; Américas Award winners Crashboomlove and Cinnamon Girl; Calling the Doves, which won the Ezra Jack Keats Award; and Upside Down Boy, which was adapted into a musical. He has received the National Book Critics Circle Award in poetry as well as a Guggenheim Fellowship and previously served as California Poet Laureate. He has taught at both California State University, Fresno and University of California, Riverside and held the Tomás Rivera endowed chair in creative writing. He lives in Fresno, California.